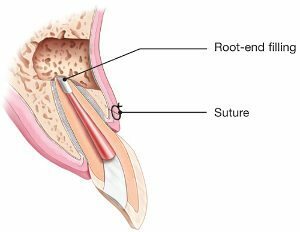 An apicoectomy is an endodontic surgery performed to heal any infection that occurs or won’t heal after a root canal is performed. Teeth are held in place by roots. Depending on whether a tooth is a front tooth or molar or premolar a tooth will have one or two roots. 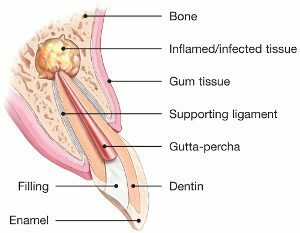 When the tip of a root where nerves and blood vessels enter the tooth becomes infected, removal of the apex is often needed to completely clear the infection. How is an apicoectomy performed? 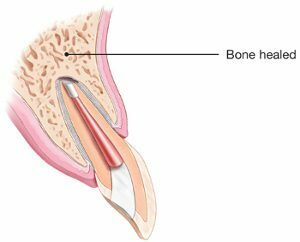 An apicoectomy is performed by making a small incision in your gum, lifting the tissue, and drilling through the bone to gain access to the root. While this sounds invasive, this is commonly referred to as an endodontic microsurgery because it requires such a small incision. This procedure typically takes 30 to 90 minutes. The longer the surgery, the more complicated the tooth structure likely is. What does an apicoectomy do? 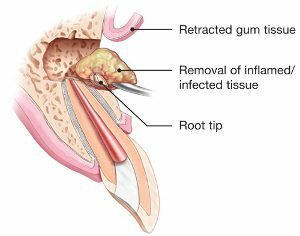 An apicoectomy is used to clear and treat infections that have not been cured through root canal therapy. During this procedure, Dr. Adam Harkrider will use an operating microsurgery to see into the tiny branches that can get infected. He will then remove the infection and seal off the channels so that re-infection does not occur. When is an apicoectomy performed? This surgery is often performed by Dr. Harkrider after a root canal has been performed or if the root canal isn’t possible. One common reason an apicoectomy would be performed is when a tooth has a crown. A root canal would require the crown to be cut, whereas an apicoectomy would be less traumatic. How can I prepare for this surgery? Prior to the procedure, you’ll come into our office at Harkrider Endodontics for a consultation. During the consultation, Dr. Harkrider will take an x-ray of your tooth and the surrounding bone, review your medical history, and determine the best course of action for your unique needs.